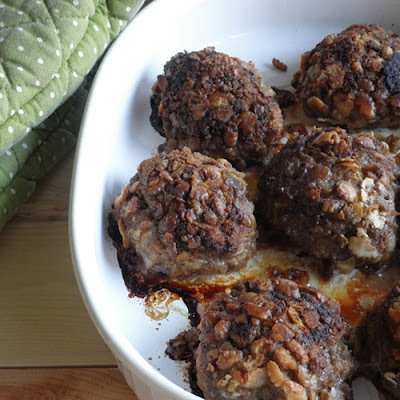 My German-Irish mother calls these "klopses," but I call them "little meatloaf balls." The recipe was passed down from her German mother, Grandma Marian Wenter-Kelly, and they've become a favorite here at my house. They're just tasty little meatloafs with a a buttery cracker crust and a soft, slightly sweet interior. The gravy is simply a can of cream of chicken soup mixed in with the pan drippings and some water (and some Kitchen Bouquet in these pics). 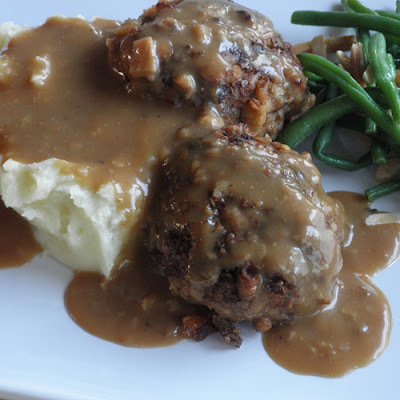 These are best served with fresh mashed potatoes and whichever vegetable you like to enjoy. A good, comforting meat and potatoes meal. In a large bowl mix the ground beef, onion, egg, salt & pepper, bread, ketchup, and milk with your hands until mixture is combined. Preheat a cast iron pan over medium-medium high heat and melt 2-4 tablespoons of butter (you may need to add more if the pan starts looking dry). Take a wad of the mixture that is about ½ to ¾ cup and roll into a ball. Coat with crushed crackers and place in hot pan. Repeat with all of the meat mixture. Fry on each side until they reach a deep brown color, then flip and fry on the other side. You may need to add more butter at this point. Fry until this side is well-browned, and then transfer the klupsas to an oven-proof baking dish. Cover with foil and bake covered for about 20 minutes. Uncover and bake for another 10-20 minutes, or until they’re crisp and done. While klopses bake, deglaze the pan with about ½ cup water. Add cream of chicken soup, scraping the pan to remove all the yummy bits. Bring to a boil, and then move to a serving bowl. Can't wait to try this one.... I know it won't let me down. 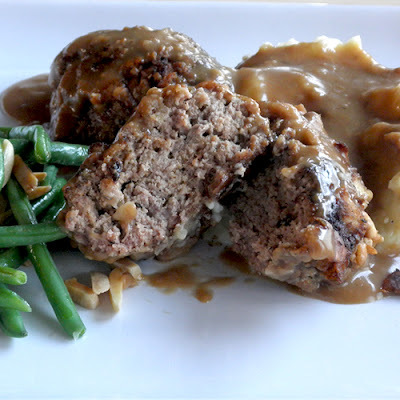 I love meatloaf and don't do a good job making it. I am putting out the hamburger to defrost for tomorrow eve. Thanx AGAIN Kelly. I'm thinking this comment is from Willa. You go, girl. :) Let me know how they turn out for you. I love meatloaf and most German foods I've had so this should be a smash tonite!! Best thing is I have everything needed in my kitchen!! Thank you!! "Klopse" is the German name. Oh my gosh! Thank you! I'm going to update the title right now!